Running is one of the most enjoyable kinds of physical activities that everyone’s into right now. In fact, there are a lot of marathon events that involve running. There are also fun runs for people who are into running but not yet ready for longer miles. People usually run any time of the day, but for people who are busy with their day jobs, it can be impossible to run during the daytime. This is why people prefer running at night which is riskier because of limited visibility. This is where headlamps come into place. Headlamps will help you see more during the night. This will help you notice any danger along the way so you can avoid it. But with the many headlamps on the market today, it can be challenging to choose one. Fortunately, I’ve gathered 10 of the best headlamps for running to help narrow down your options. This Petzl Reactik+ headlamp is light in weight and is packed with different features that will keep you safe while running at night. It is equipped with 300 lumens and has different beam features for you. This headlamp is water resistant and is using a reactive technology so the lighting’s intensity can adjust based on its surroundings. This headlamp is Bluetooth capable, which will let you communicate with other people using Morse code. It can also be used to track the life of your battery to ensure that you won’t run out of battery while you’re running at night. 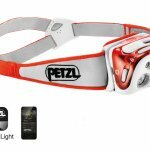 This Petzl Nao headlamp is known as an interactive product available on the market right now. It has a light sensor which has the ability to adapt your lighting needs instantly. With its reactive technology, your headlamp will adjust to your environment, thus saving the life of your battery. It also includes two lighting modes, which are the Max Autonomy for burn time and brightness, and the Max Power level. This Nap headlamp offers a maximum beam distance of 135 meters and only weighs 6.5 ounces. It also has a USB connection so you can recharge it anytime you, please. Now, once you’re done using it, you can store it, and its lock feature will help you to turn it on when you’re not using it accidentally. The Petzl Nao will give you a ho-hands lighting activity and as well as comfort. 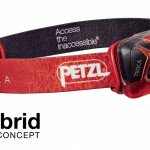 This Petzl Pixa 3 Pro is known for its longevity and performance. It has a crush resistant of up to 80 kilograms and has a 50 lumen, which is perfect for your early morning or late night run. This headlamp has an adjustable LED, which will let you adapt to any kinds of movements and situations for long range and close-up vision. One of the good things about this headlamp is that it has three different lighting modes, which will illuminate everything that’s in front of you. 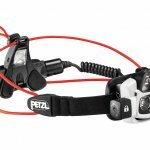 The Petzl Pixa is powered by two double-A batteries that can last for up to half a day when you’re using your headlamp on a lower setting. It also has an indicator, so you would know if you are running out of battery already. 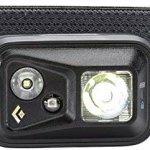 This Black Diamond Spot is one of the most affordable headlamps today. Its affordability is not the only reason why a lot of people love it because runners also find this bright, durable, and comfortable. The headlamp is equipped with 300 lumens and is using a PowerTap Technology, where you can quickly change between the available lighting settings. Some of its lighting settings are lock mode, red night vision, strobe, and dimming. One of the good things about the Black Diamond Spot is that it offers a brightness memory option, which means that you don’t need to go through the options again. Another good thing about this headlamp is that it’s water and weather resistant, so you can run even under the rain without worrying about damaging your headlamp. 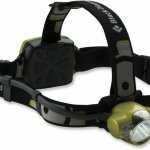 The Black Diamond Sprinter headlamp is affordable and light in weight. It has the ability to produce a total of 200 lumens and is known as the perfect option for people who love to run at night. 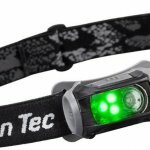 This headlamp comes with a battery that’s rechargeable, while the headband is adjustable, so you don’t have to worry about anything when you’re running. One of the best features that this headlamp has is the rear red taillight strobe that it has, which will provide you with the visibility that you need at night. This Olympia EX080 headlamp has a military grade illumination, which means that it will never give you any unpowered light. It has a hand lockout feature which means that you will not be going to be able to switch it on or off accidentally. This headlamp is equipped with 550 lumens LED light to ensure that it can illuminate no matter where you are. 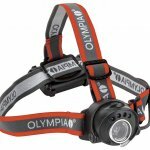 Its aluminum frame is lightweight, which makes this headlamp great for runners. It has a CREE XM-LED, which provides a great illumination which is available in five settings. One of the best things about this headlamp is that it’s water resistant, wherein it can get submerged to as deep as a meter for half an hour. 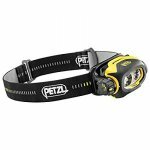 The Petzl TIKKA headlamp provides 100 lumens and has a design that’s user-friendly. A lot of people love the locator that can glow in the dark and the ability of the headlamp to charge itself when not in use. 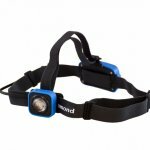 This headlamp has three different lighting modes, which are the distance vision, movement, and proximity. It also has red lighting which will ensure that the other runners near you won’t go blind. This Petzl TIKKA can be powered by a rechargeable battery or by a standard battery. It is durable and lightweight, which also makes it weather resistant. When using the headlamp at its highest level, it can illuminate to up to 80 meters and can last for 250 hours. 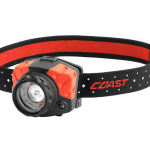 The Coast FL85 headlamp is comfortable, durable, and of course very affordable. It provides a total of 540 lumens, and when it is in its lowest setting, it can provide a total of 75 lumens. The light can be adjusted because of the twist Focus Technology that Coast has. Lastly, this headlamp can provide light to up to a total of 564 feet. The Black Diamond Icon headlamp has 320 lumens for maximum visibility. It comes with a battery pack, which is a little heavy, but it perfectly balances with the strap’s design. One of the best things about this headlamp is that it is waterproof, which means that even if it’s raining, you can still use it to run at night. It also has a night vision and is available in blue, green, and red colors. Another good thing about the Black Diamond Icon is that it has DoublePower white LED and a QuadPower LED spotlight. It has a brightness memory, so you no longer have to go through all the settings again. The Princeton Tec Remix is affordable and simple and will surely help you with your running sessions. It has different lighting settings, from 150, 125, 100, and 70 lumens. You can adjust with any settings that you want when needed. This headlamp is powered by triple A batteries and can last for 150 hours in total. Headlamps are usually being classified based on the maximum amount of the visible light that they can emit or popularly known as lumens. The number of lumens that your headlamp can provide you an idea as to how bright the light it can produce. It will also help you know the length of light it can reach. Majority of the headlamps today have a switch where you can switch from different brightness level for maximum visibility and maximum output. Choosing a lower setting will help you save battery. Most headlamps for running have 60 to a total of 500 lumens. Another thing that you need to consider is the battery of the headlamps that you’re going to purchase. This is also known as the headlamp’s burn time. 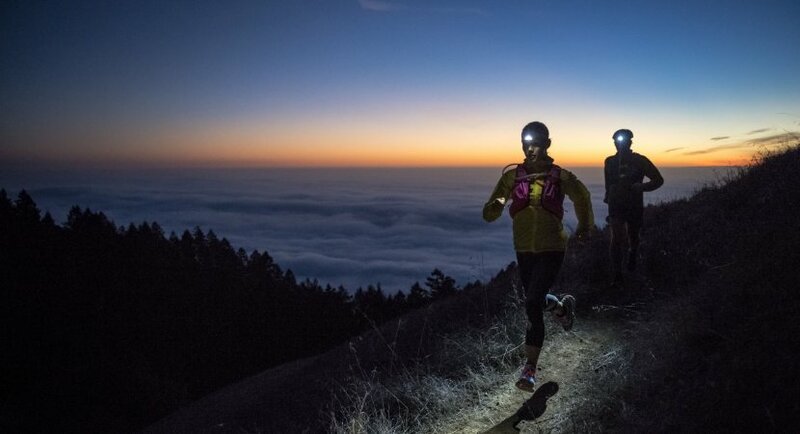 Most headlamps that are high-end are offering longer burn times. There are also some who are offering features that can assist you in conserving the battery. Also, the headlamps sometimes use disposable batteries or rechargeable ones. The weight is also essential since you will be running and you surely don’t have something heavy to get in the way. Using a lighter weight headlamp will make running more comfortable with you. But of course, there are some headlamps with added stability which can be heavier than usual. This may be useful if you are a person who is running on trails that are uneven. Of course, don’t worry because there are also headlamps that offer the stability that are known to be light in weight. All you have to do is to make sure that you’re comfortable with the weight of your headlamps once you start running. As someone who runs, it would be best to have a versatile headlamp. You should not only choose something that will give you light while running but as well as one that is weatherproof and durable. For people who don’t know, headlamps usually have the power to withstand a certain amount of water. It would be best to choose something that can be submerged in the water for at least thirty minutes. The reason behind this is because they will pretty much survive during wet conditions. There will be times where you will be running during cold or rainy days, and your headlamp should withstand this. There are some brands of headlamps that offer additional features that you might like. For instance, you might want something that has a firefly mode to help you save batteries. There are also some that have the ability to detect ambient light and can help decrease or increase the brightness automatically. There are also some headlamps that have a dimming mode so you can fine-tune the lamp’s light output. Some of the other features may include, Bluetooth connectivity, smart functionality, or more brightness levels. All you have to do is to find the right one for your needs. If you are going to run at night with limited lighting or no lighting at all, choosing a headlamp that can produce extremely bright light would be best. This is perfect for people who are running after sunset or before sunrise. The best headlamp for you would be something that can produce a minimum of 100 lumens. Of course, there are also headlamps that can produce 500 lumens, which is exceptionally bright. Now, for people who are running under a limited ambient light, which is usually 45 minutes before sunrise or after sunset, then a headlamp with a minimum of 60 lumens would be best. Headlamps with a minimum lumen of 60 can already help provide enough light during this kind of situation. If you are someone who loves running and can sometimes run for more than two hours, then this means that the battery life can be crucial. The best thing that you can do is to make sure that your headlamp is using a battery that can provide you more than five hours. This will give you ample time to run without having to change your battery pack. If you are running for a short period of time or less than an hour, you have the option to choose any headlamp for as long as it has decent battery life. But you should remember that if your headlamp has a low battery life, the chances of you changing or charging your batteries often is high. You surely don’t want that hassle, so it would be best to choose a battery life that can last long. As mentioned above, headlamps are perfect for running as it can help light up your path. But there are more advantages that your headlamps can give you. Continue reading below so you can get to know some of the advantages of using headlamps. One of the advantages of using a headlamp when you’re not running is that you can use it as a regular flashlight. You can just hold the headlamp with your hand if you prefer that. It can help you find things at home or even in your car. This means that you no longer have to purchase a handheld flashlight to use since you already have a headlamp. Since headlamps are worn on the forehead, this means that once you are wearing it, you will never go dark. You can use the headlamp to check for compass, map, and dome. This is perfect for people who are often outdoors to do outdoor activities, especially at night besides running. You can use it during camping or hiking during night time or during the early mornings. There are some flashlights that are heavy, but even if they are light in weight, it can still be tiring to hold one while you’re doing something. But with headlamps, you will never have to get tired of holding and carrying it. You also don’t have to worry about the headlamp being too heavy for your head or neck because headlamps will never be too heavy for your neck. Another good advantage of using a headlamp is that you don’t have to worry about dropping it. It is on your head, and you actually have to remove it for it to fall accidentally. No matter what you’re doing, your headlamp will stay on your head securely. One of the best advantages of having a headlamp is that it can help free your hands. This is extremely important if you are going to work on something while wearing your headlamp. If you are fixing your car, you definitely need two hands to work on it, and your headlamp will do all the illumination that it needs for you to be able to fix your car. Also, you can use both hands when you’re running down the trail, and you come across some carnivore. You need to use both of your hands to defend yourself, and the light on your head will help you where the attacker is coming from. When running at night, having proper lighting will help. As mentioned above, using a headlamp for running will help see what’s ahead of you, especially if you are running through a trail that’s uneven. Of curse, it would also be best to carry a spare battery in case your headlamp’s battery starts acting low. It would be best to run with someone especially at night; it is most less likely that you will get an attack when you are with someone. Plus, when your headlamp starts running out of batteries, you won’t be left alone running in the dark on your own. You have a friend with you who can guide you through the path that you are running in. Of course, the best thing that you can do especially when you’re running at night is to know the trails that you will be passing on. The best thing to do this is to run during the day so you can familiarize yourself with the trails. It can be easy to be disoriented if you are not familiar with the surroundings that you’re running on to. So make sure to familiarize yourself before you start running during the night. Lastly, another important thing when you’re out running is to make sure that you are having fun. Enjoy the cool breeze and the path that you’re running on to. Just don’t forget to wear your headlamp so you can freely enjoy what you’re doing. With all of the best headlamps for running above, you will surely be able to run during the night safely. Choose the best headlamp that will give you the features that you need using the guide provided just for you above. In this way, you no longer have to spend a lot of time researching them. Start your running session once you have the headlamp of your choice.